As Guyana and the rest of the world await Guyana's President Donald Ramotar's announcement of the dissolution of the Parliament and the naming of a date for general elections, the United Kingdom (UK) on Thursday resumed pressure on the South American country for the suspension of the law-making body to be lifted. 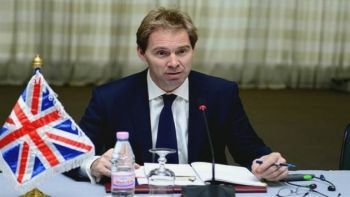 The UK's Foreign Office Minister, Tobias Ellwood, called for the earliest possible resumption of Parliament as required by Guyana’s Constitution and the Commonwealth Charter. He also urged the Guyana government to hold long-delayed local governnment elections. “The UK Government views with concern the continued prorogation of Parliament by His Excellency President Ramotar and calls for its earliest possible resumption. Parliament is required by Guyana’s Constitution and the Commonwealth Charter, it provides the necessary checks and balances and enables citizens’ voices to be heard. The suspension of Parliament therefore means that an essential element of a functioning democracy has been put on hold. “We also continue to have concerns that there have been no local elections for over 20 years, which is also contrary to the democratic principles of the Commonwealth Charter and Guyana’s own Constitution. This is not the first time that the UK has issued such calls; the others having been through its High Commissioner to Guyana, Andrew Ayre. Ramotar prorogued (suspended) the Parliament on November 10, 2014 just hours before the opposition-controlled 65-seat National Assembly was due to debate and pass a no-confidence motion in his administration. His subsequent repeated calls on the opposition to meet to resolve a number of political issues and agree on a post-suspension parliamentary agenda have been rejected. The opposition A Partnership for National Unity (APNU) and the Alliance For Change (AFC) have both said that they are tired of empty talks and vacuous promises and would consider dialogue only after the Parliamentary suspension has been lifted. Days after Opposition Leader , David Granger had written to Caribbean Community (Caricom) Secretary General Irwin La Rocque requesting an emergency summit on the political impasse in Guyana, the President held a press briefing and promised to name elections date early in 2015. He is yet to do so. Observers have reasoned that the President's latest promise was an attempt to prevent the Guyana situation from being raised on the margins of the Caricom-Cuba summit that was held in Havana in early December. The Organisation of American States Secretary General, Jose Miguel Insulza has also called for an early end to the prorogation of the Parliament.